So today my sister reminded me that Super Bowl Sunday is coming up this weekend so i thought I would dedicate my post today to that. First I want to share with you some general tips to help make your Super Bowl at least somewhat healthier, because every little bit counts, and then I will share with you some specific recipes I found that are healthier versions of common Super Bowl foods. 1. Don’t go starving. You will eat everything. Try and eat something light like a small salad topped with a few slices of grilled chicken or hard boiled eggs an hour or so beforehand. 2. Make sure there is a veggie tray with low fat dip and if you must sit by food, sit by that. Do not sit next to the potato chips (unless of course you don’t like potato chips and will not be tempted by them but I don’t know many people like that). 3. If you are making chicken wings bake them instead of frying or better yet make your own chicken tenders with boneless skinless chicken breasts. See below for a few recipes. 4. Reduce calories in your recipes by substituting lower fat items such as nonfat yogurt, reduced fat cheese, leaner meats and skinless chicken breast. 5. Use veggies or whole grain crackers or tortilla chips for dips. Lots of beans and veggies in this chili… All that fiber will surely fill you up! The sodium content is a little on high side but it is for a main dish portion so if you have a snack size portion and watch the amount of sauce you use, you should be ok.
Super easy dip recipe for those who don’t have time or like to cook! A much better alternative to picking up a saturated fat and sodium laden cheese dip at the grocery store on your way to a party. And avocados are a great source of healthy fats. The only adjustment I would make to the recipe would be to use a reduced fat feta cheese. And watch your portion size because although avocados are filled with healthy fat and lots of vitamins and minerals they are also calorie dense due to the fat content. Let me know if there are any other sorts of healthier Super Bowl recipes you would like to see! At least twice a month, I make stuffed mushrooms. They are super easy to make, flavorful and perfect for a busy weeknight meal. You can really change up the flavor by using different cheeses, vinegar, spices and veggies for the stuffing. If you need some meat in your mushroom, sausage could also be a great addition. 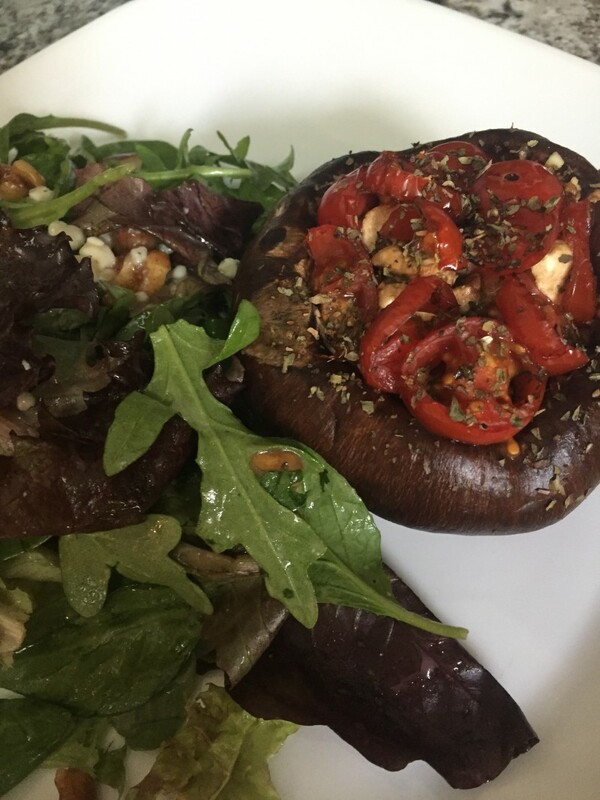 Personally, when I make stuffed mushrooms I like to pile in lots of cheese and veggies. For a side I may do a fresh salad or whole grains to make a more complete meal. Preheat oven to 350 degrees F. Remove stems from mushrooms and rinse clean. Place upside down on a cooking sheet. Distribute cheese, basil, and sliced tomatoes evenly between each mushroom cap. Drizzle balsamic vinegar over feta mixture to taste. Bake in oven at 350 degrees for approximately 15 minutes or until mushroom caps are soft.